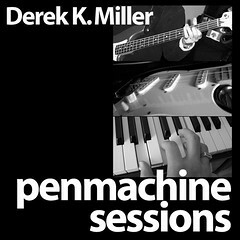 This is "Penmachine.com: October 2003," a page that archives an entire month's entries from my online journal. The latest material for that month is at the top. For my newest entries, visit the home page. My wife and our friend Leesa took me to play Bingo this week. Normally, you might think that would be a pretty dull idea, but it's much more interesting when the game is run by an acerbic drag queen. If you're not fond of trying to set up a wireless network with your computers, another alternative is HomePlug, which runs networking communications over the existing electrical wiring in your house. SMC has just announced some cheaper HomePlug products that work with any Ethernet-capable device, from Windows and Mac computers to the PlayStation 2. Trust and credibility are major issues on the Web, where even the biggest company exists only as a few words and pictures inside a browser window. The most deceitful and unethical company can look as good as a company with a long history of community involvement and honest customer relationships. Explaining who you are and where you come from does matter, as do simple things like providing management biographies and photos. [...] Just remember to include a simple link to the About Us section. The link doesn't have to be the first or most prominent. If you're using a standard left-hand navigation column, you can place this link at the very bottom of the list. Just don't hide it. So, er, do you want to find out about me? Does your mom's computer have properly configured firewall ports? Joe Average user is in trouble, says The Register . Alas, that's quite true. Now, I've been a Mac guy for a long time, and I've long recommended them to anyone who asked me what kind of machine to buy. (Especially because I usually end up being on-call ad hoc tech support for people to whom I recommend computers, and it's a lot less work supporting a Mac.) Previously, however, I would not have resisted much if someone insisted on buying a Windows machine. As its 95%+ market share indicates, Windows is good enough for most people, and of course there is a lot more software and hardware (not to mention other people to do tech support) out there, more easily available, for Windows machines. However, I think it's becoming increasingly unwise to buy a Windows box, not because the Mac's user interface is better and the Mac OS generally stays better out of the way of what you want to do (though that's still true), but because it's just getting too dangerous. The Register article explains why. If you're technically inclined enough to get a machine that would normally run Windows, yet choose to run Linux or some other open-source operating system on it, great. Similarly, if you can learn enough about Windows security to set everything safely, use less vulnerable Windows applications, and update your software regularly, you can just as well continue to use Windows. But if you're Joe or Jane Average and need a computer, a Mac is getting to be the safest way to go. That's no longer just a political statement. It's actually, and sadly, true. Recently, TidBITS Electronic Publishing, which has put out a free weekly Mac-focused newsletter since 1990, started a new series of e-books called "Take Control." Its first two titles are relatively short (about 50 pages) and have sold more than 3000 copies in total, at $5 USD apiece, since Friday. While the initial download is a password-protected compressed archive, the unpacked file is a regular old PDF you can read on nearly any computer or handheld. The success of the first two Take Control books demonstrates, I think, why major publishers' attempts at selling e-books are failing, and why, for instance, Barnes & Noble has stopped selling them in the States: until now, they've generally been too expensive and too restrictive. I recall being astounded when first reading about mainstream books being available electronically, because the publishers were charging the same kind of money (maybe trivially less, sometimes more given bookstore or online discounts) as for printed versions. Although I understand that there are many fixed costs in the release of a major novel or non-fiction work, it just seemed spiteful not to pass the savings in printing, distributing, and remaindering all that paper on to purchasers—especially for technical books, whose lifespans are so short. Plus many e-books required proprietary software that made it difficult to move them from one device to another, even for clearly fair-use reasons, such as buying an e-book on a desktop machine and moving it to a laptop or handheld for actual reading or printing out, or loaning it to a friend—something I've always done with paper books anyway. So I, despite being a techie early-adopter type who loves the idea in principle, have never bought a single e-book. It's the same kind of bad business reasoning that crippled the record labels' first online purchasing systems. People won't generally pay the same amount of money (or more!) for an electronic download as for a physical product, especially if that download is less flexible than what they're used to with the older, proven style. Steven Johnson of Slate explains how Amazon could make Search Inside the Book even more useful. Jason Kottke lists some things an instructor at his work asks people to do when learning, and talking. I don't do nearly enough of them. How often do many of us (especially us of the male sort) proceed with discussions mostly so we can say things and be right, rather than to listen or learn? I know I often do. Ooh ooh, look at me, look at how much I know. It's hard to learn that way. And even harder to be a good person that way. I'll keep working on it. PC Magazine has a good overview of quality PC speaker systems and what to look for when choosing one. There's lots more information at Extreme Tech. Might Creo Tokens become to file transfer what Adobe's Portable Document Format (PDF) is to viewing and printing documents? Maybe if Creo makes the technology open, as Adobe did with PDF, so other programs can make and serve tokens, just as anyone can write a program to create PDF files. By the way, Creo was started by my former Boy Scout leader, whose son was one of my best friends in elementary school nearly thirty years ago. The company's HQ is about 15 minutes' walk from my house. When I first read today that you can now search inside Amazon.com's books, I though, "Hey neat." Seventy-one percent of college students use the Internet as their research tool of first resort. [...] For most students today, if something is not on the Net, it doesn't exist. And yet most books are not on the Net. This means that students, among others, are blind to the most important artifacts of human knowledge. For many students, the Internet actually contracts the universe of knowledge, because it makes the most casual and ephemeral sources the most accessible, while ignoring the published books. [Amazon's new approach] shifts power away from the people who own finite sets of copyrighted material and toward the people who offer access to information about where this material can be found. Information about books, not ownership of copyrights, becomes a new center of power. [...] Amazon's Search Inside the Book is not an ebook project. It is merely a catalog. But a decade of Internet history proves that the catalog is exactly what you want to own. I started getting a little woozy when I realized what's going on. Here: search for the excruciating Latin name of a common green sea urchin. Strongylocentrotus droebachiensis is not in the titles of any books, but Amazon finds it on the pages of a whole bunch, and then lets you see the pages. Soon we will have, in effect, Google for books. Eventually, every book Amazon carries, as well as others in the public domain catalogued elsewhere. Perhaps most of the books in the world, and maybe most of the books ever published. That's huge. I bit the bullet and reinstalled Mac OS X this evening. It went pretty smoothly—Archive and Install did a good job. Some things even seem faster. I guess I'm not running Windows after all. Dori at Backup Brain compares Apple's new 12" G4 iBook to the very-similar 12" G4 PowerBook. Apple has intentionally crippled the iBooks (as well as the consumer-level iMacs and eMacs) so that—even though their video chips can drive two independent screens at once with an expanded, multi-monitor desktop—when plugged into an external display, they will only mirror whatever appears on their internal one. PowerBooks have no such limitation. There is a dual-monitor hack for iBooks, and I know two people who have applied it without trouble. Is the hack the same for these new models? Assuming it is, I did a custom-config test on the Apple Canada site for similarly configured 12" G4 iBooks and PowerBooks the way I would like them. The difference was large—about $2000 Cdn for a G4 iBook with 640 MB of RAM and otherwise maxed-out (except for Bluetooth, which would add another $75), and nearly $2700 for a similar G4 PowerBook with only 512 MB of RAM. If the display hack works, and you don't mind a bit of extra weight, a slightly less-nice keyboard, a plastic housing instead of aluminum, less cache, and a few other minor differences, why would anyone buy a 12" PB right now? My Mac must have heard me take its name in vain. A couple of days ago Mac OS X mysteriously refused to boot. I did some tweaking and playing and reinstalling, and things came back to life. Disk images will not mount (the message "Waiting for Disk Copy helper..." appears for awhile, then Disk Copy quits). That means I can't install or reinstall anything that comes as a disk image. Which is almost everything for Mac OS X. Grr. The mouse doesn't work. I mean any mouse, using the old Apple Desktop Bus (ADB) plug on the back of the Mac or on my keyboard, or the newer Universal Serial Bus (USB) on an expansion card I've installed. What's weirder is that keyboards do work. If I set up the disabled-accessibility features to use keyboard keys to replace the mouse, that works fine, and I can type at will. Even stranger, if I reboot in "Safe Boot" mode (holding down the Shift key), ADB and USB mice work again. But disk images still won't mount. Everything is normal in Mac OS 9 if I start with that old operating system instead. So there are two things wrong: some kind of program conflict for the mice, which is resolved by starting up in Safe Boot mode; and another kind of file corruption or something which is preventing disk images from loading. I could probably fix the first one with some troubleshooting, but I suspect the second requires more drastic action. I've tried repairing my disks and fixing disk permissions, zapping the parameter memory, and all sorts of things. No dice. I may have to try a reinstall of the operating system, which is a huge big pain—I almost feel like I'm using Windows. Sigh. CanadaRAM looks like a decent place to buy obscure (or not-so-obscure) memory chips for laptops, desktop computers, and even musical instruments and samplers. I've never used the company, but my friend Simon has, and says "their prices were good, shipment was fast." So I'll keep them in mind next time the "must... have... more... RAM" bug strikes me. A few days ago, as we were walking in the door of the Burnaby Still Creek McDonald's down the hill from us, we noticed a sticker on the door advertising free wireless Internet access inside. The Wi-Fi is not all-you-can-surf—ask when you order and you'll get 45 minutes of access with a $3 minimum purchase. You can pay $3 for an additional 45 minutes. The project is part of a slow rollout across Canada, which began in July in Ontario. I didn't try it out. I don't carry my laptop everywhere, especially not when coming from the swimming pool with the kids. Instrumental rock tunes have one big advantage over those with vocals: the composers can call them whatever they want. There are no lyrics to match up to. They also don't have to be (although they can be) as self-consciously clever as jazz instrumental titles usually are. I wonder how often someone's built an album by coming up with the track titles first? As I was running the numbers for my third-quarter Goods and Services Tax return today, I came across some completely useless receipts. Groceries, for instance. Or those from White Spot restaurants. While I can claim half of some meal expenses when entertaining or meeting clients, as I do on occasion, it would be pretty hard to convince Revenue Canada that I was doing so when there are two Pirate Paks on the bill. What she said this morning when approached by a wasp in our garden: "I'm so scared that I can't stop talking!" That sounds like a good title for a song. Online phenomena do not have to make money to be of value to people. [They] can change individual lives—and even, conceivably, the world, in some way—without needing business models and marketing machines. He's following up on Jay Rosen's thoughts about weblogs and journalism, and in particular that weblogs come "out of the gift economy, whereas most (not all) of today's journalism comes out of the market economy." Now we're off to celebrate Tara, who turned 31 this week. Happy birthday! It seems silly for me to have to say this, ten years after the World Wide Web started going mainstream, but the home page of every website should be useful. Too often, however, they're not, and a persistent problem remains the splash page. Many Web sites have splash pages. Why? "It looks good" or "for branding purposes" are common explanations. Splash pages disorient visitors by offering a look and feel different from the rest of the site. They can kill the mood for visitors who are buying on impulse. They're an obstacle on the way to more relevant content. They're often used incorrectly, asking visitors to choose a path. That's often better handled with proper information architecture. Think about it this way: When you go to the websites you read regularly, do you go to a splash page or something with actual information on it? Would you ever bookmark someone's splash page in your browser, on purpose? The main problem is that the Web is about links, and splash pages aren't—so they don't, in general, belong on the Web. Not anywhere you want people to come back to, anyway. Sure, my oldest daughter (age five) is learning to read, and to play piano, and all sorts of useful things. But here's a real sign of her growing up: today, entirely on her own, she managed a first-place gold trophy in the 50 CC Flower Cup in Mario Kart 64, Nintendo's go-kart racing video game. If you provide professional services—such as the editing, writing, and musical performances I do—tonight's Editors' Association of Canada session in Vancouver on improving your selling process might be useful. It takes place at the YWCA Health & Wellness Centre on Hornby near Dunsmuir in downtown Vancouver, at 7:30 p.m., and costs $5, unless you're an EAC member, for whom it's free. My main computer, a Power Macintosh G3 (designed in 1997, bought by me for close to $3000 Cdn in the spring of 1998, and discontinued by Apple at the beginning of 1999) will no longer run the latest version of Mac OS X. People with pre-release versions of Mac OS X 10.3 "Panther" confirm that it refuses to install on such an ancient system. Similarly, my PowerBook 1400, which is even older, can't run anything newer than Mac OS 9.1. The latest version of MSN Messenger, which I use for most of my instant messaging, runs only on Mac OS 9.2 and above. Older versions no longer connect to the Messenger chat network, and so are useless. Yes, Apple and Microsoft, you are beating me: the time for a new computer will soon be at hand. All that's required is the money. Ah, the money. A few months ago I was getting 6 spam e-mails per hour. Now it's up to 9. My spam filter catches almost all of it. About 1% are false positives—not spam, but tagged as such. A few false negatives—spam, but not caught—slip through per day as well, but they're easy to delete. Here's what that means: between last Wednesday and this morning, the filter nabbed more than 1000 (yes, one thousand) e-mail messages. About 10 weren't actually spam, and I had to retrieve them from the spam filter's database. I've also deleted several dozen spams that slipped past the filter. If the rate stays the same instead of rising (I wish! ), I'd receive 80,000 spam messages in the next year. Depending on their average size, that's between 250 and 500 megabytes of pure digital crap. In the real world, by October 2004, it will be more crap than that. Parents have lots to worry about with our kids. We always have. Millennia ago it was marauding animals. Last century it included any number of fatal and incurable diseases. Today there are fast cars on busy streets, Internet pedophiles, and obesity-inducing fast food. "When I was young, I had nothing like this," Brunot says. "I was an only child. I wanted to do swimming. I wanted to do gymnastics. My dad, he didn't care about things like this. He just liked to go outside, visit monuments; we would go to the sea." "You've got to realize the times we're in right now. You've got to help them out. Otherwise, they're going to stay far behind," says Dr. Spiro Photopoulos, who admits that even though he got into medical school, he spent much of his youth "always playing outside, always doing things at the last minute. "I didn't want that for them." He didn't? Why not? Is it no longer okay to be a kid and not have to worry about schedules and deadlines? There's heavy pressure to have our kids get extra schooling, or be in soccer and ballet and language lessons and after-school programs. Yeah, my oldest daughter wants to learn piano, and both our kids took swimming classes in the summer. But there should be time for playing on the swings, running around a field, walking through the forest, or just sitting around the house doing nothing in particular. Will that be big-endian UTF-2, sir? I just learned a whole bunch from Joel on Software's text character encoding article. You can too. After a few weeks of research, it seems that the $1500 Cdn Yamaha P90 is the best digital stage piano for our needs. It meets all of my must-have criteria, and has a number of other niceties too. All it lacks is built-in speakers. But there is enough PA equipment kicking around our house to deal with that—and besides, with the $500 extra that Yamaha charges for the P120 (which otherwise isn't that different from the P90), we could buy a pretty powerful amplification setup anyway. Sierra Wireless, for whom I've done a fair bit of technical writing work over the past few years, has just announced the Voq phone, a smartphone that uses the GSM digital cellular phone network and Microsoft's smartphone operating system. Finally, though, someone has made a phone with a thumb-keyboard in it that isn't a massive monster—because the keyboard flips out and folds up. The phone is actually the size a phone should be. No pricing yet, and the phone won't be out till early next year, but it looks promising. While I usually read my e-mail several times a day, I have been letting my read messages accumulate for a couple of months without filing them in mail folders. So even after deleting all useless stuff, spam, and other message not worth keeping, I had nearly 600 e-mails in my Inbox, and a couple of hundred others in a few automatically-filtered folders. It took me three hours to go through them all, filing, deleting, removing attachments, and so on. My Social Security number is an artifact of the 1930s, a master identifier that has to change not just into a number that is harder to copy, but into a feisty little program that has only my interests at heart. When someone wants my Social Security number, I want my number to ask, "And who the hell are you?" Smart numbers have to be combined with truly instant log tracing that enables me (not some investigator who won't investigate, but me who will) to track my data wherever it goes. I own my data, so the path it follows should be available to me, too. [...] If nobody else can follow that trail, then I want to follow it myself. Multiply that by tens of millions and see what happens. Better than becoming a hermit in the mountains, anyway. Lost in Translation is an excellent movie. It's slow, with big pauses, and it's sad, but it's also quite funny. And how did Bill Murray sneak into being such a good actor? He's astounding in the subtle way he plays his character—and subtle is the last thing I would have imagined in his days of Saturday Night Live , Caddyshack , and Ghostbusters . His role as Bob Harris reminded me of his earlier (still good, but not as good) performance in Rushmore , though without the earlier character's nastiness. There are even similar scenes in swimming pools, where you expect something significant or at least slapstick to happen, but all Murray does is think as he swims. It takes skill to play a scene with no talking, yet where the audience knows what you're thinking anyway. I use Google AdSense on some of my essay pages to help pay for the hosting of this website. With my traffic, the income is small (I haven't seen a cheque yet), yet not trivial either. Google's terms of service for AdSense did make me uncomfortable when I read them (I did read them), but I figured I could always remove the advertising code if I got really concerned. I'm starting to get a bit concerned right now. I'll keep the ads up for the time being, though. Money talks. For more than three years now, I've specified how the text on this website looks using what's known as a Cascading Style Sheet (CSS). That's just a text file that lives on my web server, along with all my web pages, but the web pages point to it to find out what font to use, what colour to make things, whether links change colour when you hover your mouse pointer over them, and so on. In theory, I could change the whole look of this site—making it white text on a black background, or orange on blue, or whatever—by editing the one file. That's nice. Here's an excellent and clear introduction to how style sheets work in web pages (via Dori). My former boss Bernie is the subject of a fascinating profile in BC Business magazine. And I thought his name was complicated after he shortened it. I've been going on and on about shopping for a piano so much that I haven't mentioned the far more important thing my daughter needs if she wants to learn how to play: a good teacher. Fortunately, we found an excellent prospect today. She's Lorraine Crowe, the local Royal Conservatory of Music representative. She's been teaching for a long time, has a lovely basement studio with five pianos (among other instruments)—as well as a Nintendo-equipped waiting room, a candy jar, and life-size stuffed Mike and Sully characters in the middle of the teaching room—and gets along well with kids. One of her first questions to my daughter was, "Do you want to take piano lessons, or is it your dad's idea for you to take them?" My daughter answered honestly (that it was her idea), but I'm glad Lorraine asked the question. Even better, the studio is three blocks from our house. Of course, Lorraine is also booked solid (no surprise), but she may be able to squeeze my little girl in. I hope so—even though she recommended a few other teachers for us to talk to, just so we get an idea of what the marketplace is like. And I hope my daughter actually has fun playing piano, of course. That's the whole point.